These classes provide everything you need for a typical modern main application window, like the main window itself, menu and tool bars, a status bar, etc. QMainWindow is the central class around which applications can be built. Along with the companion QDockWidget and QToolBar classes, it represents the top-level user interface of the application. QDockWidget provides a widget that can be used to create detachable tool palettes or helper windows. 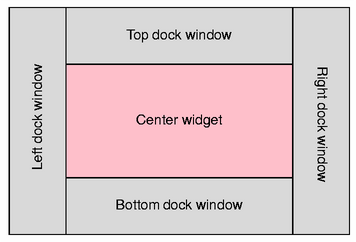 Dock widgets keep track of their own properties, and they can be moved, closed, and floated as external windows. QToolBar provides a generic toolbar widget that can hold a number of different action-related widgets, such as buttons, drop-down menus, comboboxes, and spin boxes. The emphasis on a unified action model in Qt means that toolbars cooperate well with menus and keyboard shortcuts. Using QMainWindow is straightforward. Generally, we subclass QMainWindow and set up menus, toolbars, and dock widgets inside the QMainWindow constructor. To add a menu bar to the main window, we simply create the menus, and add them to the main window's menu bar. Note that the QMainWindow::menuBar() function will automatically create the menu bar the first time it is called. You can also call QMainWindow::setMenuBar() to use a custom menu bar in the main window. The QToolBar and QMenu classes use Qt's action system to provide a consistent API. In the above code, some existing actions were added to the file menu with the QMenu::addAction() function. QToolBar also provides this function, making it easy to reuse actions in different parts of the main window. This avoids unnecessary duplication of work. In this example, the toolbar is restricted to the top and bottom toolbar areas of the main window, and is initially placed in the top tool bar area. We can see that the actions specified by newAct and openAct will be displayed both on the toolbar and in the file menu. In this example, the dock widget can only be placed in the left and right dock areas, and it is initially placed in the left dock area. The following diagram shows the configuration produced by the above code. Note that the left and right dock widgets will occupy the top and bottom corners of the main window in this layout. The central widget can be any subclass of QWidget.